Hi everyone! 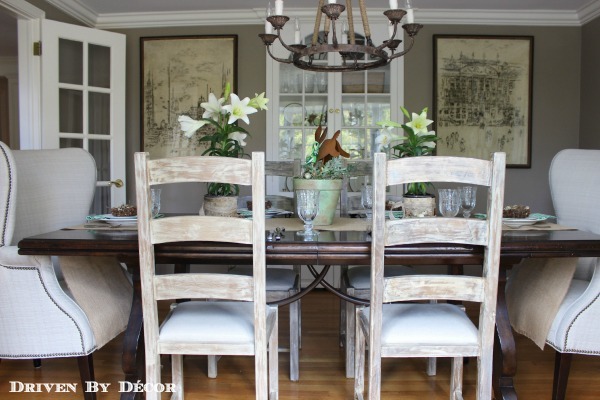 I'm Kris from Driven by Décor and I'm so excited to be dishing about my favorite room today. I've been reading Kim's blog for years and adore her style and all of the amazing projects that she shares so thanks so much Kim for having me! Our cabinet is a workhorse, holding all of our china, crystal, and vases but she's needs a little freshening up - new hardware and something fun lining the back of the cabinet is on the way! Thanks so much Kim for asking me to be part of this fun series and to all of you for coming along on my dining room tour! 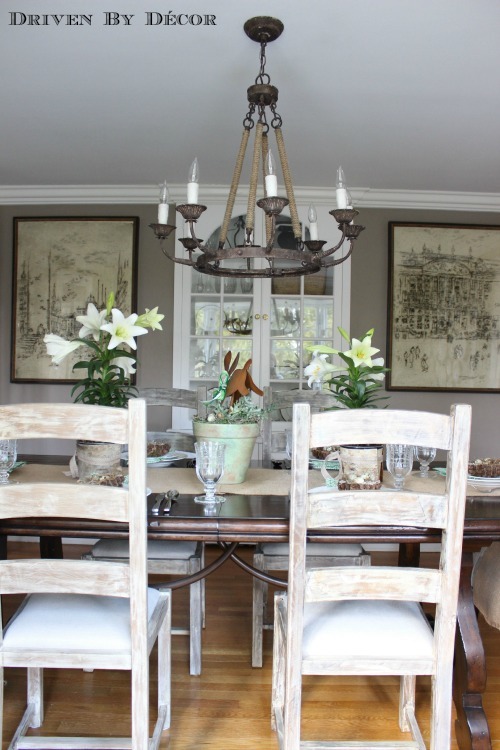 Kris, thanks so much for sharing your gorgeous dining room. I love your plate wall. If y'all don't know Kris and her blog Driven By Decor I hope you will go over and visit and see some more eye candy. I hope y'all have a wonderful weekend. It is going to be gorgeous out and I will most likely be working in the yard. So much to do. Beautiful job, love the colors very calming. Such a fantastic update from the before! LOVE the plate wall & the wall color especially! What an amazing update! I love Kris' style! I love her plates and platters wall design! Thanks for sharing her fabulous dining room! Okay, I don't know where you live (I'm in the South), but I bet you could hear my scream of delight when I saw this post. The plate wall! The table! The artwork! The BUILT-IN CHINA CABINET! Be still, my heart. And even though I am not a neutral type, I love the way this turned out. I can also commiserate with the new-house-renovation-a-little-bit-at-a-time syndrome. I'm right there with you. But from what I can tell of your DR, the rest of the house is going to be just as fabulous. Pinning to my Gorgeous Home board! Kris's dining room is lovely! I am heading over there to visit. Thanks for featuring her Kim! What a pretty room! I love the calming neutral color of the room framed by that crisp white. Those French doors are marvelous, too! Thanks for sharing! I'm in love with Kris's plate wall!!!!!! To have a built-in china cabinet would be a dream. Lovely, lovely dining room! Gorgeous dining room....I so love the wall color and the plate collection on the wall. How wonderful to have a beautiful built in cabinet!...such a dreamy, stunning dining room!...Thanks Kim for another great favorite room...Have a great weekend Kim and Kris! Beautiful room! I love the plates on the wall. 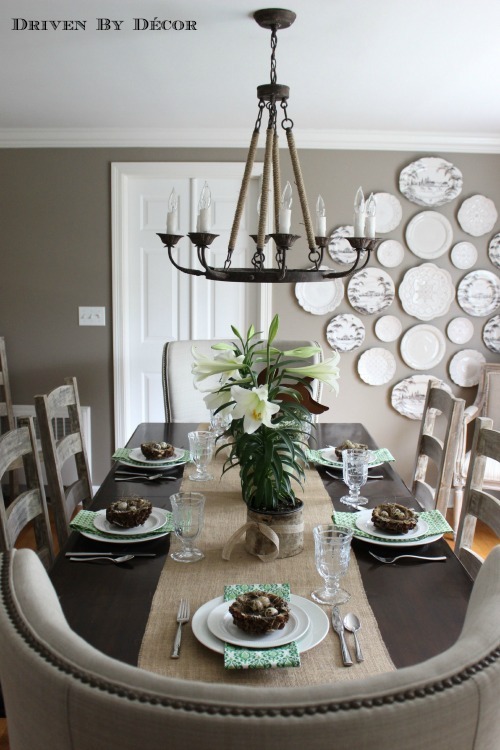 Kris's dining room is gorgeous and that plate wall is a stunning focal point! Love it! Love love farmhouse giveaway….my fav's are the bull head of course and the slatted tray!! I love Kris's entire home! I have never read Driven By Decor so I look forward to heading over for a visit. Her dining room is wonderful. Enjoy your gardening time. I have spent a few hours each day this week in the garden and it is looking so much neater. Beautiful Kris! I love the lights above the table! I love the colors! I'm not usually fond of dark colors, but you have pulled it off well! Everything is lovely! Thanks, Kim, for sharing Kris with us! Finally a symmetrical plate wall! ...girl after my own heart. It's beautiful! I sure can see why this is her favorite room, it is spectacular! Every detail is perfect: the plate wall, the built in hutch, the chandy everything!!! Thanks for sharing thus amazing space!!!!! LOVE it!!! Breathtaking! So beautiful. I love the plate wall and AND everything else too. Definitely going over to visit. 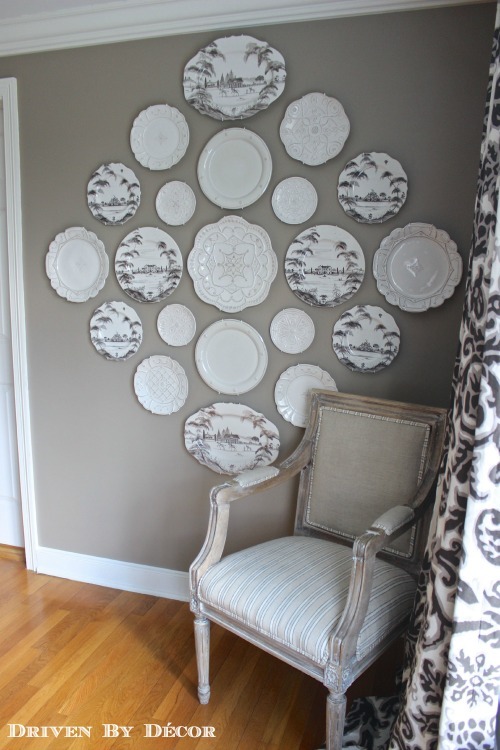 Kim, Her dining room is beautiful....love the plate wall! I am headed over to see more. Blue is my favorite color and normally I love a blue room but what you have done in this room is stunning.I love your collection of plates. What a great statement and focal point. This makeover should be featured in a magazine. Could you share the wall color? It's gorgeous! What a beautiful dining room! 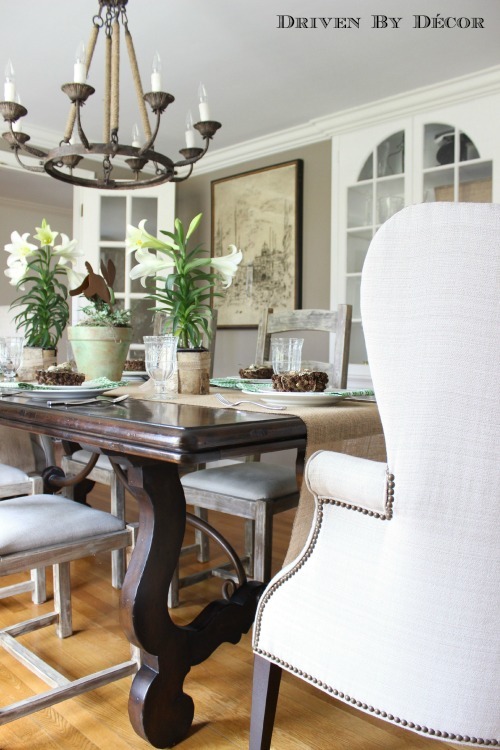 I love the neutral soft colors used and those amazing chairs on each end of the table. I also like the plate wall. 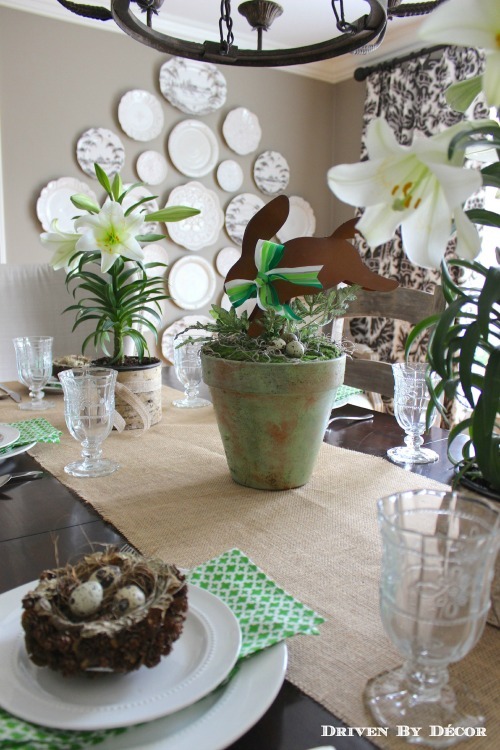 The table setting is perfect for Spring. I LOVE Kris' home, she has a great eye for creating warm, casual yet elegant spaces! It's fun watching her inject personality into her new home with her amazing diy skillz! OMGosh...just love that plate wall...such a stunning statement! The entire room is beautiful! Thank you so much for sharing Kris and Kim! Wishing you both a wonderful weekend! Love Kris and her dining room is so great! I love the etchings and the plates and the whole color scheme! Glad to find this blog through her as well! 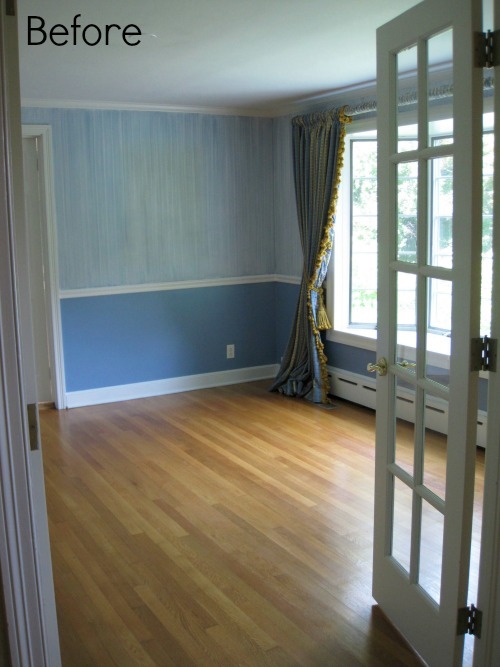 Kris' dining room is lovely and must be a great space in which to entertain. The plate display is very pretty. Thanks for sharing, Kim. 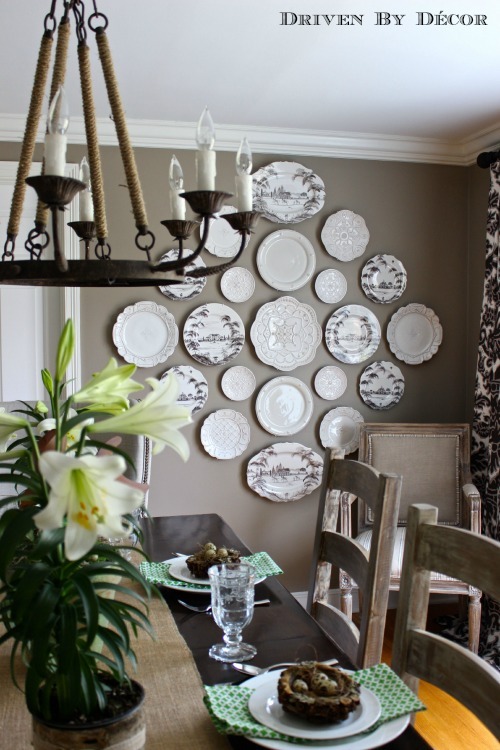 That is one beautiful dining room....and that plate wall is beyond words! 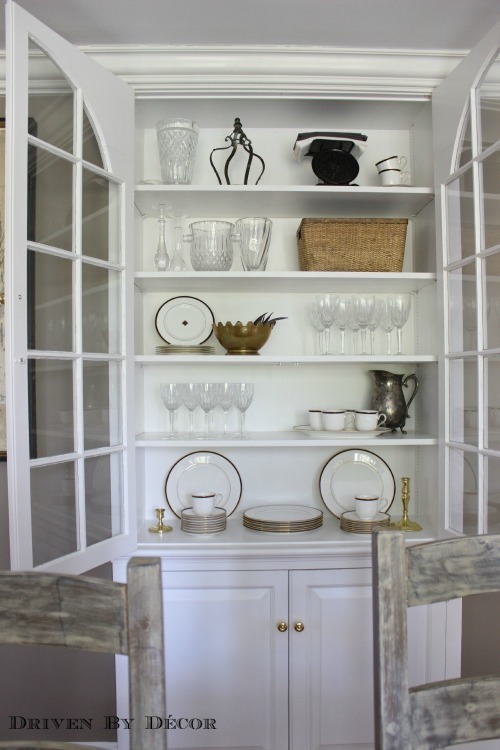 I love that wall color, the host chairs, the plate wall….the china cabinet!! Kris has such amazing style!!! Thanks Kim for introducing Kris to us. Oh my I love her dining room light fixture, the plate wall, those gorgeous upholstered chairs and her dining room table. Talk about a well put together room! Now I'm off to her blog to start following her. Oh Kris this is a gorgeous room, love the display of dishes you hung on the wall. I also really like your dining room chandelier and the captain's chairs. Gorgeous. Playing email catch up!! Thanks for hosting Driven By Decor. I love Kris and her blog!